To maintain a healthy and productive existence in sports, the physio is the pathfinder. Physiotherapy can be defined as the science of physical rehabilitation, and the primary goal of a physio is to help the players overcome muscular, skeletal and neurological problems, and in doing so, help them achieve complete fitness. Physiotherapists need to have all the proper qualifications. They should be well-versed in the assessment and treatment of soft-tissue injuries. A large number of the sports injuries that they encounter call for a comprehensive knowledge of biomechanics, tissue pathology and the healing process. The physio of a cricket team provides fitness programmes for the players and monitors the rehabilitation of injured players, keeping their careers in mind. The physio can provide enormous relief to injured players with his quick-start programme and on-ground treatment. Immediate access to treatment services for sports injuries has been shown to have significantly accelerated the healing process and allowed for the early return of the player to regular training and active participation. Most sports injuries occur in soft tissues (sprain, strains, contusions or joint inflammation). A physio has to be on his toes throughout the game. A good physio will be able to diagnose and assess the nature of the injury and its severity on the ground itself, and start treating and managing it immediately. Let me narrate an incident that took place in the 1999-00 season, during a Ranji Trophy game between Karnataka and Mumbai. I was the physio of the Mumbai squad. On the third day, some 15 minutes after the tea-break, Abey Kuruvilla, one of the finest fast bowlers to represent Mumbai and India, twisted his left ankle while bowling his third spell of the day. I attended to him and realized that the ligament had been overstretched, i.e: what we describe in medical parlance as a 'first-degree sprain of the talo-fibular ligament'. It was difficult to decide whether to get him to carry on or to take him off the field and treat him. After talking to Sameer Dighe, the captain, I took the responsibility of taking him off and making him ready to bowl flat out the next day, the last of the match. We needed Abey to be at his best the next day as we had to take eight more wickets to win the game. For two hours, I applied ice on the injured area for 10 minutes, then took a 10 minutes break, then applied ice again for ten minutes, and so on. The idea was to prevent swelling. During this two-hour exercise and another whole hour, I kept his leg elevated at an angle of 30 - 40 degrees, which helped remove accumulated fluid from the area. After that, I used physiotherapy machines and equipment with anti- inflammatory ointments and taped the injured area for the night. When we checked the ankle the next morning, we could not find any swelling or pain. I asked him to walk and do some slow stretches (as there was some stiffness) and weight-bearing exercises. 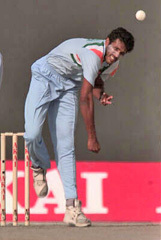 The left ankle of a right-arm fast bowler bears the maximum weight of the body, just before the ball is released, and Abey being a right-hander, it was critical for him to feel confident that his ankle was in proper, 'playable' condition. He said that he was feeling okay. We applied ice for around 10 minutes and I then strapped his ankle. Abey took the field, and the ball. He bagged five wickets in the first session itself and we went on to win. Had I not taken the responsibility and allowed him to play the previous afternoon, the injury might well have aggravated and turned into a second-degree sprain or tear of a ligament, which would have rendered him unfit for atleast 3-4 weeks, and the period of recovery and recuperation would have been much more.